New American cuisine in a casual al fresco setting. Chef Ryan Studebaker of Prepkitchen Del Mar Restaurant was one of our 2011 Top 5 Rising Chefs in the US. : Locals and foodies gather for lunch and dinner at this Del Mar eatery, conceived by the savvy Whisknladle team. The former calls for salads like warm white beans and arugula with red onion and Parmesan, or a down-home country meatloaf sandwich, plump with cabbage slaw and watercress on ciabatta. House-cured meat and California cheese platters dot the tables at night, along with tempura green beans or bacon-wrapped dates as starters. Comfort in a bowl arrives as house-made tagliatelle with pork sausage ragù, or the steamy layered lasagna with eggplant, olives, caramelized onions and cheese. The kitchen also prepares a shrimp salpicon tostada stacked with avocado, cilantro and queso fresco with peppers, chile oil and harissa aïoli for a little heat. 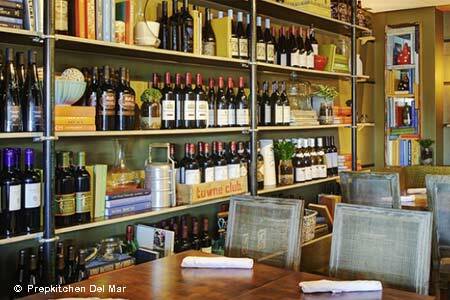 Diners savor the thoughtful fare and sip artisan beers and carefully selected wines. For dessert, dip into the warm chocolate budino with salted caramel gelato. Service is low-fi yet professional, and the friendly vibe makes for a fun night. Brunch on Sundays means gourmet donut holes, farmers market scrambles, chilaquiles, burgers and more.